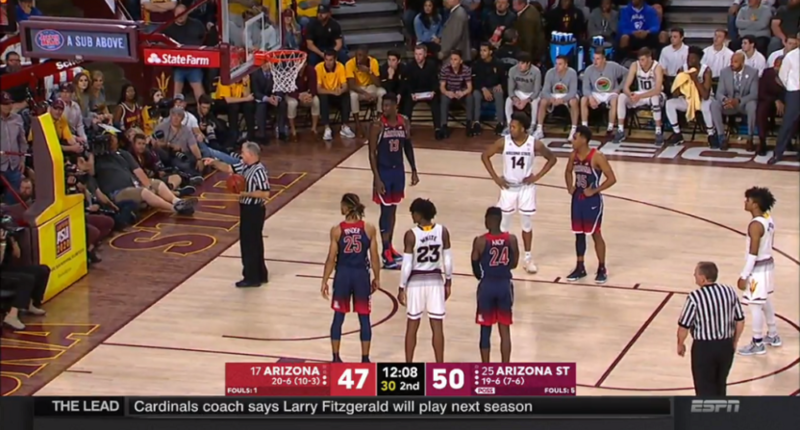 During the second half of Thursday night’s Arizona-Arizona State basketball game in Tempe, ASU’s Remy Martin stepped up to the free throw line. But before Martin could shoot, he was interrupted by the referee, who was busy ejecting an Arizona male cheerleader. Did an Arizona cheerleader just get ejected? Don't think I've ever seen that before. WHOA. An Arizona cheerleader just got kicked out of a game for reckless heckling. Can't say I've ever seen that before. An Arizona cheerleader has been tossed. This rivalry is lit. Did that Arizona cheerleader get thrown out because he has the hairline of a 48 year old?